I express gratitude and joy daily. 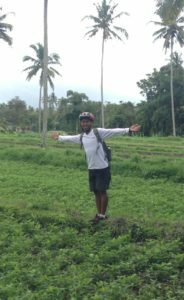 I’m nearing the end of my time here in Bali with a few days to go. 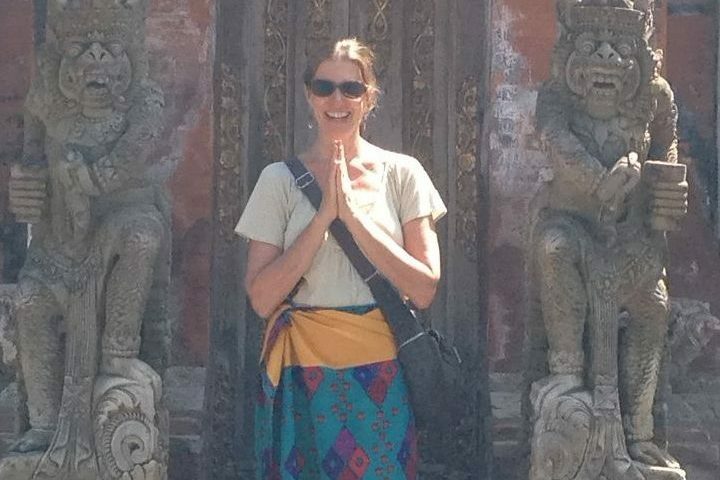 Despite the uncomfortableness of enduring multiple earthquakes, nursing a cold/cough, and riding some turbulent emotional waves, I’m absolutely filled with gratitude for everything Bali gave me. 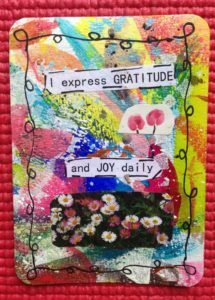 This card and affirmation is dedicated to all the beautiful people I met over the last fifty days and the richness they brought to my journey. Let’s have a look. Firstly, I start with my husband Bruce who has given me nothing but support in my need for some solo voyaging. I know many people think it quite unconventional for a middle aged woman to be traveling without her husband (but why, I ask, why? for if I were single would anyone bat an eye?) Yet, I’ve always said I wanted the ‘ultimate relationship’ in my marriage which comes with a need for some fierce autonomy. Many who know me will know I uphold a banner for all people to remain sovereign in their beings for that is often what is needed to evolve and develop along one’s life path. Being in a committed relationship whilst being autonomous is a great gift and I am indebted to Bruce for his unwavering encouragement for me to follow my inner compass. 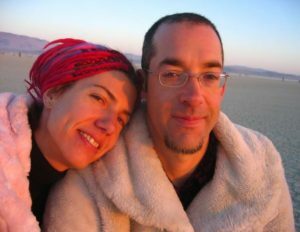 Here’s one of my favorite photos of us, circa 2006 Burning Man. 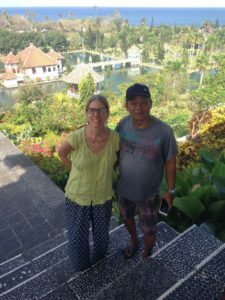 Nyoman was the first person I met – the apartment manager for my place in Ubud. Always with a smile, she comes daily to make the rounds and see to anything I need. 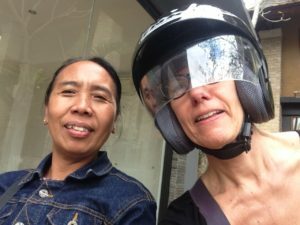 She arranged transport, managed my laundry, and often scootered me around town. Her English is good but not enough to have conversational depth. 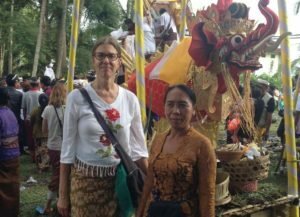 She invited me with her to attend two cremation ceremonies – these ‘event’ days happen at least twice a month during July & August and is a big ceremonial day for the villages and families for whom a loved one is being sent off. It was an eye-opening and beautiful experience to be amongst this ceremony. I also got to visit one of her relatives’ homes. 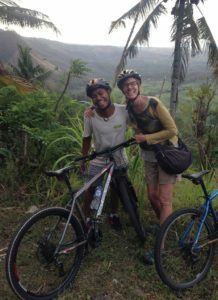 I managed to do four downhill cycling day trips – twice in Ubud and twice in Amed. I spent quite a bit of time with the guides during the hour-long car rides to/from our destinations and throughout the day. These guys all spoke English well and I was able to ask a lot of questions about Balinese culture and traditions. 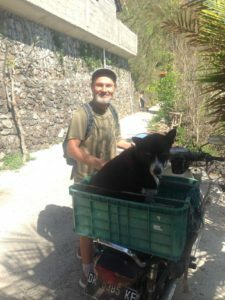 I particularly enjoyed Mono, the 25 year old East Bali Bikes guide, especially as he complimented me on my downhill cycling skills! He thought I was a badass! 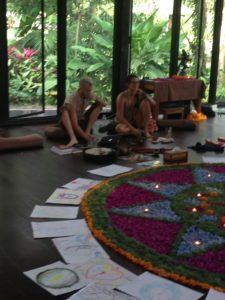 I took quite a few classes from two amazing light workers/healers: Devi Ma and Levi Banner. 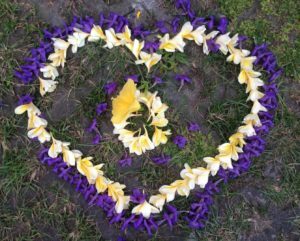 Shamanic Breathwork, Cacao Ceremonies, Women’s Circle, Astrology Reading, and Shamanic Reiki trainings all lined up perfectly. 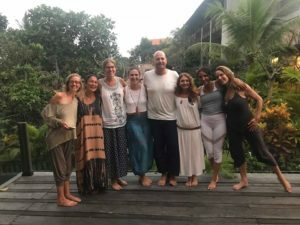 We had a small cohort for our Reiki 1 & 2 trainings and I’ve connected and hung out with a few of these lovely souls. And I’m already scheming for how and when I can continue working with Devi Ma and Levi. All shall be revealed in due time! I posted about Dewa on Facebook. 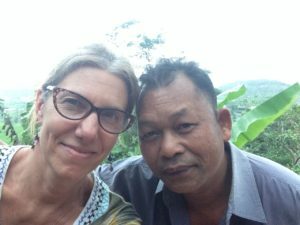 I met him the day after the ‘big’ quake in Lombok when I fled the seaside coastal area of Amed for the hills of Tirta Gangga. Full of cortisol and fairly shaken up, I landed at a ramshackled lodge of which Dewa was the sole employee. Conversing with him, I found out that his little cement blocked house had crumbled the night before, yet he showed up for work (I don’t think it’s in the culture to ‘call in sick’). He was visibly distressed as was I and we bonded over the unfolding tragedies. My heart was really open and I could feel his pain. We spent maybe a total of one hour together over a 24 hour period and I felt strongly to aid my fellow man so I gave him a wad of bills (around $175 USD). He cried, I cried. It was a tender one-heart moment. There truly is something special about the people of Bali. Always offering kindness or a smile, they seem chilled out and relaxed despite working long hours and six or seven days a week. I think I was in as many people’s photos as I took of them for the Balinese seem to love having their pictures taken with tourists/Westeners! I always felt honoured when someone wanted to snap a photo with me! Thank you Bali for having me. I think I’ll be back.